U.S. equities are pausing for breath on Tuesday as major technical resistance levels fail to relax their grip on the major indices. The Dow Jones Industrial Average has hit an air pocket around the 26,000 level. The S&P 500 has hit a pocket near 2,800. These are the first major pauses since stocks bottomed on Christmas Eve. A number of factors are in play. Weeks of positive rumors have failed to develop into a hard trade agreement between the United States and China. Profit takers have suddenly emerged. Some of the economic data, particularly out of Europe, has been disconcerting. And President Trump is the target of a new series of investigations out of the House of Representatives, raising political risk. But there is good news as well, suggesting the upswell could soon resume. 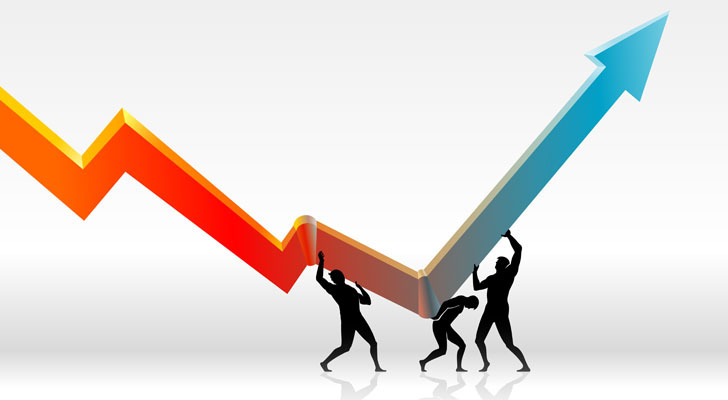 Retailers have been reporting good results. The job market remains red hot. And the Federal Reserve is maintaining its newly dovish tact. 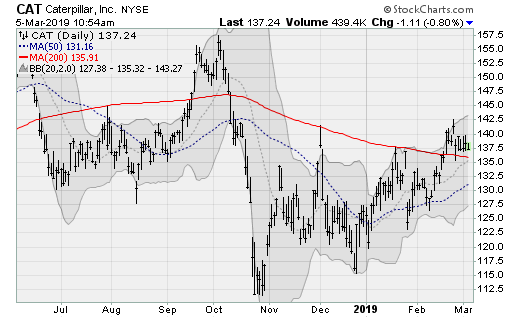 Caterpillar (NYSE:CAT) shares have recently popped up and over their 200-day moving average and are now consolidating the move, building a base of support near its early December high setting up a possible attempt at the early October levels. Such a move would be worth a gain of 15% from here. The move comes despite a recent downgrade by analysts at UBS citing concerns about revenues and margins in 2020. CAT will next report results on April 24 before the bell. Analysts are looking for earnings of $2.86 per share on revenues of $13.3 billion. When the company last reported on January 28, earnings of $2.55 per share missed estimates by 44 cents on an 11.2% rise in revenues. 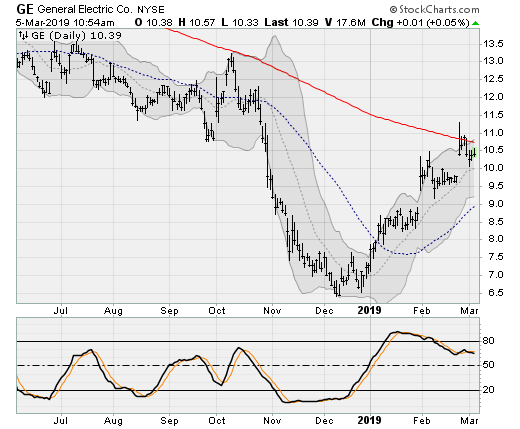 As far as large-cap stocks go, not many people have been talking up General Electric (NYSE:GE) recently. But shares are closing in once again on their 200-day moving average, setting up an upside breakout for the first time since late 2016 — after which shares suffered an epic 80% meltdown. Since bottoming in early Decembers, the bulls have cobbled together a 60%+ rally on glimmers of hope management’s turnaround plans are finally getting traction. The company will next report results on April 18 before the bell. Analysts are looking for earnings of 13 cents per share on revenues of $28.11 billion. When the company last reported on January 31, earnings of 17 cents per share missed estimates by five cents on a 5.3% rise in revenues. 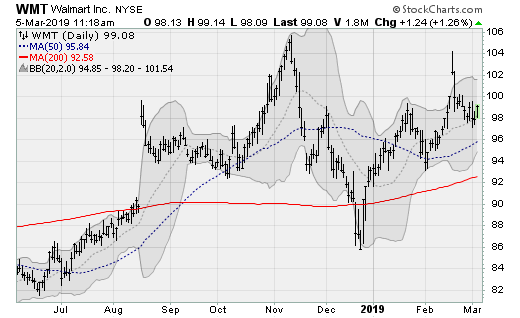 Walmart (NYSE:WMT) shares are in the midst of a long sideways consolidation range going back eight months, but should be good at the very least for a rally to the November highs — which would be worth a gain of more than 7% from here. 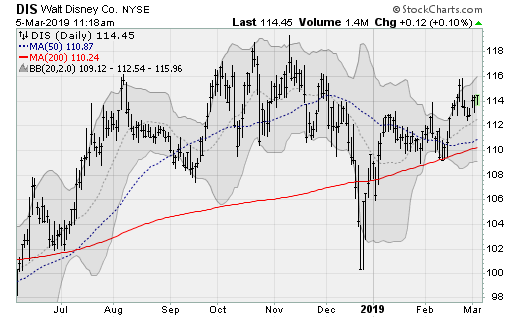 The level is also associated with the early 2018 highs, so I would become a seller of this large-cap stock near those levels. The company will next report results on May 16 before the bell. Analysts are looking for earnings of $1.02 per share on revenues of $124.4 billion. When the company last reported on February 19, earnings of $1.41 per share beat estimates by eight cents on a 1.9% rise in revenues. Shares of Disney (NYSE:DIS) have been trading within a range going back to July, which in turn caps a range going all the way back to the summer of 2015. Investors haven’t had a lot to be excited about since the relaunch of the Star Wars franchise and the consolidation (and great success) of creative universes like Marvel. But new things are coming, from the launch of Star Wars Galaxy’s Edge theme parks to an upcoming streaming service. The company will next report results on May 7 after the close. Analysts are looking for earnings of $1.60 per share on revenues of $14.33 billion. When the company last reported on February 5, earnings of $1.84 beat estimates by 27 cents on a 0.3% decline in revenues. Article printed from InvestorPlace Media, https://investorplace.com/2019/03/4-dow-jones-titans-ready-to-rebound-bgim/.